After many delays Intel's Ivy Bridge processors were finally unleashed on the world last month. Now here comes the notebook version. Next week we'll get a look at the first wave of Ivy Bridge ultrabooks, courtesy of Intel. The dual core 17-watt Ivy Bridge chips will power this year's crop of ultrabooks, and they'll about double the speed of video encoding. They're also closer in performance to their quad core counterparts than any generation of chips yet. They're better and faster and good, but that's expected from the newer generation. The more interesting bits are what Intel's doing with its overall gameplan for ultrabooks. In a blog post Intel says it will show off Ultrabooks powered by its new third generation Intel Core processors at Computex Taipei 2012 next week. The company also reports some shocking numbers: Intel is aware of 110 Ultrabooks in the pipeline. That's a huge number considering there are only 21 Ultrabooks out there right now. In addition to the slim but traditional clamshells we've seen so far, Intel says there are "30 touch-enabled systems" on the way of which 10 will be convertibles. Thin designs: Ultrabook devices must be 18mm or less in thickness for systems with displays less than 14 inches and 21mm or less for systems with displays 14 inches or more; some current systems are much thinner. Responsive: All 3rd generation Intel Core Ultrabook devices wake in a flash – going from a very deep sleep state (S4) to full use (keyboard interaction) in less than 7 seconds and wake from "sleep" mode even faster. Additionally, they must be responsive while active, meaning they will load and run favorite applications quickly. Extended battery life: Ultrabook devices must offer at least 5 hours of battery life, with many meeting the recommended level of 8 hours plus in even the sleekest form factors. Security enabled: Anti-Theft technology is a hardware-based technology that makes it possible to lock down an Ultrabook system if it's lost or stolen and helps secure sensitive information stored on the device's hard drive. Ultrabook™ systems come enabled with Intel® Identity Protection technology to provide a more secure online experience for activities like shopping, banking or gaming online. It uses chip-level authentication similar to hardware tokens and is widely regarded by security experts as a more secure approach than software-only authentication. Fast I/O: Ultrabook devices based on 3rd generation Intel Core must have either USB 3 or Thunderbolt technology to enable incredibly fast transfer capabilities. Processor: Powered by the Intel Core processor family for Ultrabook. The biggest changes to the requirements are increased battery life and a high-speed I/O port. Which are nice, really, but the improvements this round are experience-focused, not specs-based. You're not going to notice the difference in your ultrabook having its hardware "exposed" to the anti-theft stuff, until you lose your laptop. Same goes for the instant-on responsiveness, which is improving generation by generation as OEMs figure out their own tricks, without just following Intel's blueprint. 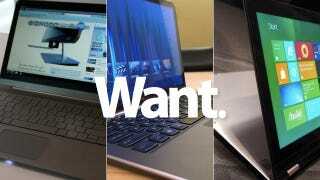 And while Intel didn't mention it in its release, it's confident that lesser-used-but-impressive ultrabook features—like the auto-updating Smart Connect tech it just signed a nationwide free Wi-Fi deal for—will make their way into this generation at a higher rate. There is still no word on when exactly you'll actually be able to buy an Ivy Bridge ultrabook, but, hey, we'll take this as a starting point.